Are there fossils in Southwest B.C.? Are there fossils in Southwest British Columbia? Yes! There are sedimentary rocks with fossil remains of a variety of ages in, and close to Vancouver. Around the west shore of Harrison Lake there are marine deposits of the Cretaceous and Jurassic Periods bearing a variety of remains including ammonites, belemnites and other mollusks. In the area of Princeton there are ancient lake bed sediments from the Eocene Epoch containing leaves like those of Metasequoia, insects and occasionally fish remains. 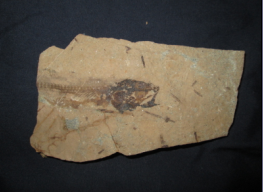 There is also a rich fossil record preserved in other parts of the province. Vancouver Island is known for its Cretaceous marine fossils including some large reptiles like the Elasmosaur and Mosasaur remains discovered near Courtenay.